I am really excited to share with you my Penang Food recommendations! It’s pretty cool how these street stalls that I’ve been visiting since I was in my mom’s womb has now become world-renown street food destinations. I could list over 100 places for yummy Penang food as good food is in abundance in this town… but I've narrowed it down to an exclusive list of 10 - the ones that you definitely should not miss out on when you are in Penang. Having lunch at a local coffeeshop ('Kopitiam') with my dad and my crew UN6, Dec 2015. *Scroll to the bottom for the link to my Google My Maps for my Penang Food and Things to Do in Penang Recommendations. Char Kway Teow is a popular wok-fried dish of flat rice noodles and egg, prawns, cockles, spring onions and Chinese sausage cooked in pork lard. Ask any local where to get the best CKT, and they will definitely point you towards Siam Road. This is a MUST try. A tough rival to Siam Road’s CKT. Hokkien Mee is a combination of both egg (yellow) and rice (white) noodles in a spicy soup (soup base contains shrimp, prawn, pork and chicken stock). 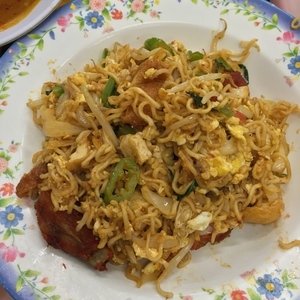 Burma Road’s Green House is my family’s favourite destination for Hokkien mee in Penang – don’t think you will be able to find Hokkien Mee more flavourful or satisfying anywhere else. My family has been visiting Sup Hameed’s for the longest time possible. We like bringing our guests here for the famous Mutton Soup (left). You can also order from a wide variety of indian food (pictured below). 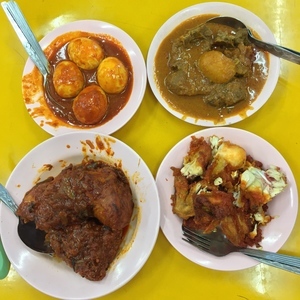 Left to right: Nasi Kandar (white rice served with chicken/ mutton curry, curried eggs, grilled tandoori chicken), Mee Goreng (Egg fried noodles with lots of garlic, spring onions and onions; served with tandoori chicken strips and grene chili), Roti Bomb (Roti prata ‘indian pancake’ drenched in amazing caramelized condensed milk), and Roti (John) Hong Kong (Indian French Toast with two sunny side-up eggs drizzled in sweet chili-ketchup. The queue for Penang Road’s famous Chendol stretches all the way to the main road. Chendol is a popular Southeast Asian desert consisting of green jelly, grass jelly, creamed corn and red beans mixed with coconut milk and shaved ice. It is common to add additional fruit toppings, like jackfruit. This is a personal childhood favourite. 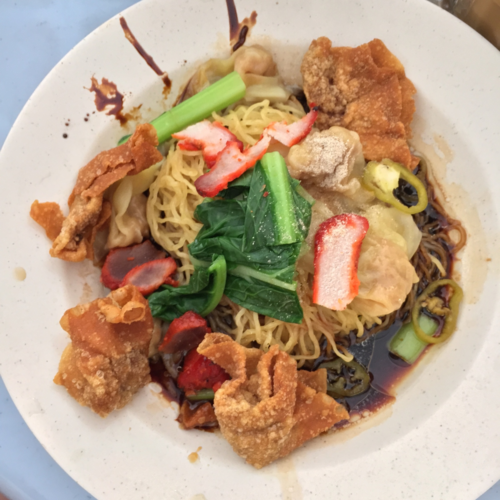 Wan Tan Mee is one of my favourite dishes, whether the noodles are served dry (i.e. in soy sauce) or in a soup. Kedai Kopi Seng Thor Hotel also serves the BEST O-Jian (oyster omelette) in… LIFE. Crispy on the edges and gooey on the inside. All of our family friends that we have brought here also concur! We usually also order of Lor Bak to share too. Lor Bak comes in a plate of assorted meats (Taiwanese sausage, deep dried chicken and marinated minced pork) and other proteins including wantons (pork dumplings) and rolled beancurd skin. It is usually served with a side of sweet chili sauce and 'Loh', starchy soy sauce with egg wisps. An open-air food center along Gurney Drive, popular with locals. Growing up, I used to come here a lot with my family for dinner. We would typically go for the Ramly burger (Malaysian style burger where the meat patty is wrapped in an egg omelette), BBQ Chicken wings, CKT and Kway Teow noodles soup; the food here is generally above average. We would then ‘walk off’ our food babies along Gurney Drive – a long stretch of road sandwiched between the sea and a row of restaurants, hotels, cafes and shops. 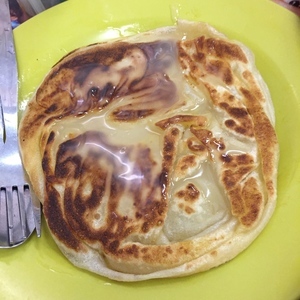 Tambun Biscuit (i.e. ‘Tau Sar Phea’/ ‘Dou Sha Bing’; Ground green bean biscuit) is my beloved childhood tea-time snack. Eating it always reminds me of my late grandfather who would always buy me a box of Tambun Biscuits from Him Heang whenever I visited him in Penang during my school holidays. Him Heang is a famous (and my favourite) brand of Tambun Biscuit. 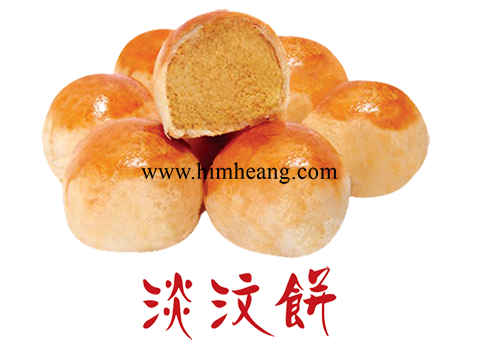 Tambun biscuits are a traditional Chinese pastry which originated in Penang. These round, oven-baked pastries encase a sweet and savoury filling made with fried onions, green beans and sugar. While the choice of ingredients might sound a bit strange, trust me when I say you won't just stop at one! When I returned to Penang last December 2015, our local friend, Yan Yan, took us for Assam Laksa at Air Itam before our ‘trek’ up Kek Lok Si Temple. Though I’m not a huge fan of this dish, many of my Penang friends have cited Pasar Air Itam Laksa as their favourite place for Assam Laksa. Penang Assam Laksa is a unique dish, not to be confused with generic Laksa. 'Generic' Laksa refers to rice noodles in a spicy coconut curry soup, topped with shredded chicken, prawns and fishcake slices. I'm not a laksa expert, but Assam Laksa has a more distinctive sour taste and pungent fish + tamarind + mint flavour. A traditional shophouse coffee shop next to a Police Station. Sin Hwa Coffee Shop is famous for its Hokkien Mee, Laksa, and Chicken Rice! Note that the Hokkien Mee usually sells out by 10am, so get there early! They are open from 7am onwards. 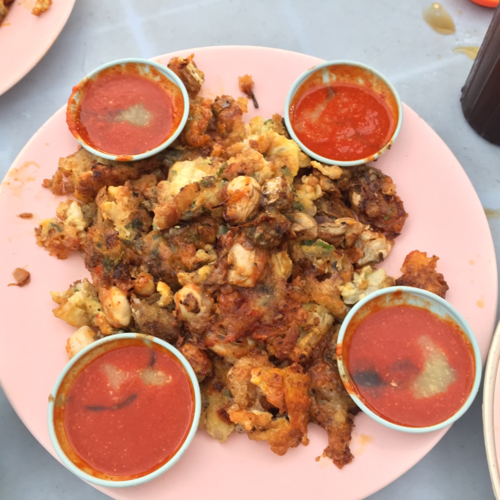 I hope you like my Penang Food Recommendations as much as my friends and family have! Access my Penang Food recommendations Google My Maps here.